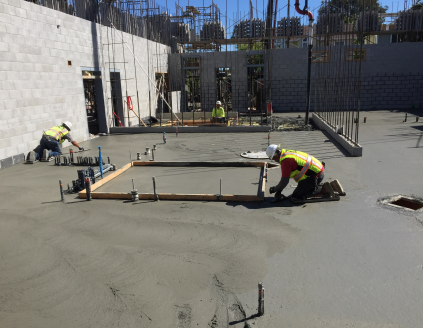 During the month of May, Alten Construction completed the slab on grade for the Office and Living Quarters areas. CMU installation for the Utility Rooms was completed and continued for the Apparatus Bay and Living Quarters. The installation of steel elements (ledgers and columns) continued for the Living Quarters. Installation of supports for the Apparatus Bay doors and for window openings (throughout) was also completed.